"She was one of the kindest women I've ever known. She and..."
"I was blessed to have met Alvina through Bonnie & Leonard..."
"Alvina was a most lovely, caring and energetic lady. 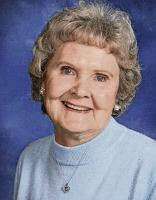 She..."
"Dear Alvina, the Dillon Family was blessed to have you and..."
Alvina Sunde Lorentz passed away in Vancouver, WA on Nov. 28, 2017. She was born on Dec. 12, 1926 in Helga Township near Bemidji, MN to John and Anne Sunde.The family moved to Bemidji, MN in 1931 where she started first grade at 4 years old, and graduated at the age of 16. After graduation, she attended business school. She got work in Bemidji for one year prior to leaving for Vancouver, WA at the age of 17. Her first job in Vancouver was for Dant & Russel. Alvina met Glenn, the love of her life, on a blind date arranged by Glenn's sister, Lois. The date was successful as they were married in 1946. Sixty six wonderful years later, they parted when Glenn was taken to be with our Lord. They were blessed with a daughter, Carol, in 1947. Alvina retired from ALCOA in the Purchasing Department in 1986. Unfortunately, the plant was closing, due to the divestiture of ALCOA. was a dedicated and loving church member. Everyone loved her hugs and kind greetings. In addition to her church activities, Alvina enjoyed ballroom dancing, sewing, traveling, and social and service events. She cherished the friendships she had made over the years. She was so grateful for all the constant love, prayers, and wonderful support from her family, her friends, the Touchmark staff, Peace Health Hospice, and her church family. In 2012, through the powers of technology, Alvina was blessed with the discovery of another sister, Dorothy Jeanne Hawkins, who lived in Corvallis, OR. She was so delighted to have a sister living close, and three beautiful nieces; Betty, Bonnie, and Becky. Alvina is survived by her daughter, Carol Sorenson; her sisters, Shirley Cuyler and Darlene Dillon; brother-in-law, Olin Bishop; and many nieces and nephews. She was preceded in death by her husband, Glenn; parents; brothers, Delyle and Dale; and sisters, Dorothy Jeanne Hawkins, Dorothy Bishop, and Lorraine Pemberton. A memorial servcie will be held honoring Alvina on Sun., Jan. 14, at 12:30 p.m at The First Prsbyterian Church, 4300 Main St., Vancouver, WA. A light lunch will be provided after the service. In lieu of flowers, contributions may be made in her name to the following: Friends of the Carpenter, 1600 W 20th St., Vancouver, WA 98660 or Presbyterian Women of the First Presbyterian Church, 4300 Main St., Vancouver, WA 98663.